Cornwall Environmental Consultants was called upon to provide solutions for landscape and ecology requirements of a particularly sensitive site in Restronguet, Feock. The client wished to demolish an existing dwelling and build a new one – nothing new or unusual there, except this dwelling was located in a picturesque position within view from the creek. The sensitive location of the site was acknowledged as a key factor in the approach to the design and overall management of the project, influencing site layout and building design. The client appreciated the need to engage the local planning officer and community from the early stages of the project, paying particular attention to feedback from the Parish Council. 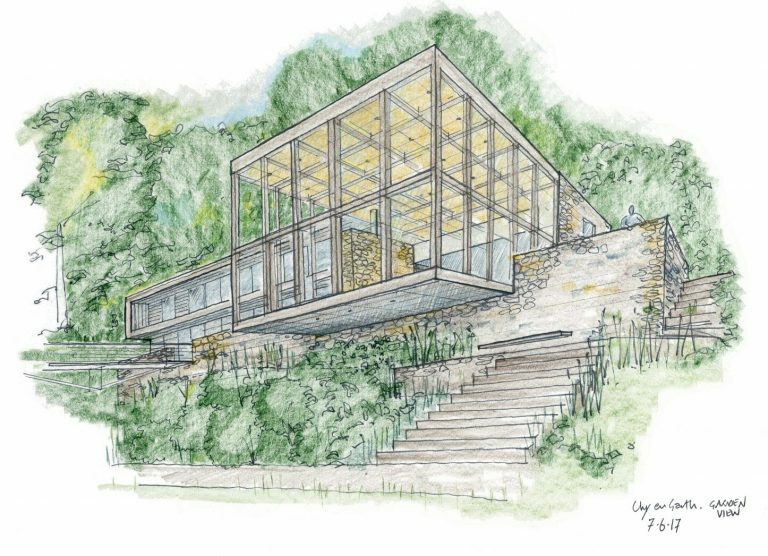 London based architects, Seth Stein, gave considerable consideration to the way in which the proposed building related to its setting in terms of design features, material and integration with its existing mature grounds. The initial landscape and visual appraisal concluded that the actual area within which any effects were likely to be experienced, was limited to within Restronguet Creek – with the southern banks around the Pandora Inn being of particular sensitivity. Retention of the exiting trees on site was a priority. They are a prominent landscape feature and provide a high degree of screening in sensitive views. Findings informed pre-application advice and discussions with the planning case officer. A landscape strategy provided a basis from which detailed landscape plans can be developed and demonstrate the context led approach to the overall scheme. Once a final design was available the Landscape and Visual Assessment (LVA) was developed into a full Landscape and Visual Impact Assessment (LVIA) to accompany the planning application. Proposals for the site fully address its landscape context and minimised any adverse effects on the area’s character and views across the creek to the site, whilst also creating a new dwelling which introduces a different style and standard of architecture to the scene. The scheme received planning approval in November 2017.